How does actin filament polymerization generates protrusive force? It has been known for some time that actin polymerization produces most of the driving force for membrane protrusion  (reviewed in ). Experiments to identify the mechanism and minimum components for actin-based protrusion have used both pathogenic intracellular bacteria in in vitro reconstitution experiments  and baculovirus in host . 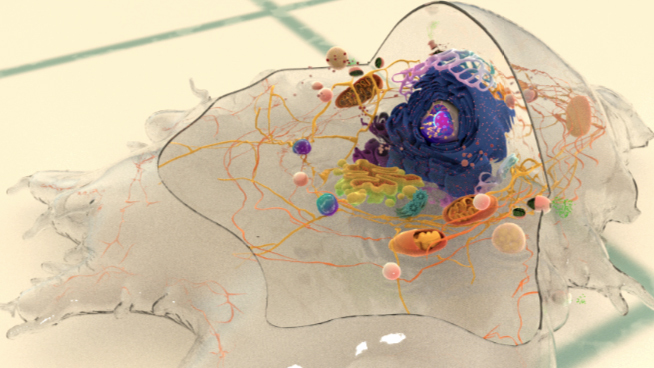 Pathogenic intracellular bacteria use mainly host-derived components to facilitate movement through (and between) cells. The bacterial ActA protein on the surface of the bacterium (e.g. Listeria monocytogenes) recruits and activates the host components needed for actin polymerization (e.g. Ena/VASP, ATP-actin). The actin filaments are assembled at the plus end nearest the bacteria membrane and the forces generated by filament assembly are translated into bacterium movement. 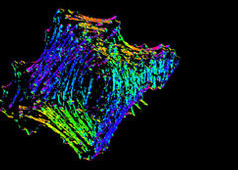 The resulting actin comet tail is likely comprised of branched arrays of actin filaments as seen from simulation of experimental results [3, 8, 28]. 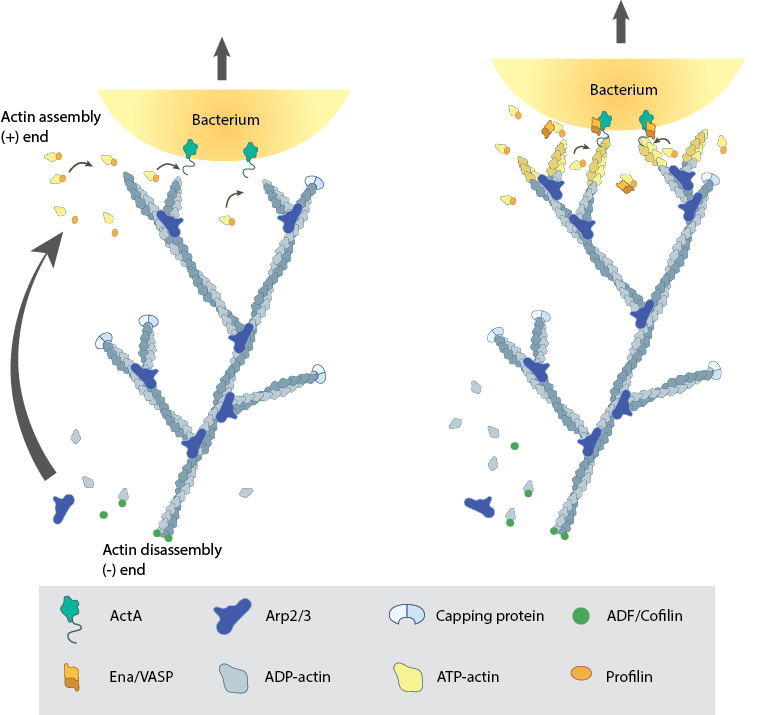 The dynamics of filament assembly and turnover (and therefore bacterium motility) are controlled by capping protein, profilin, ADF/Cofilin and Arp2/3 complex. In cells, actin filaments are initiated with their barbed ends oriented towards the plasma membrane, with ATP hydrolysis facilitating filament growth. Polymerization is favored towards the cell front and disassembly occurs more frequently at the rear (reviewed in ). However, only a small fraction of the overall free energy of nucleotide hydrolysis is needed to modulate G-actin monomer binding. The remaining energy is translated into a protrusive force that deforms the plasma membrane in a particular direction   (reviewed in ). The propulsive network is self-organizing and filaments with a particular orientation,with respect to the membrane, will assemble at the maximal velocity and be preferentially chosen for elongation . Similarly, cell shape and migration speed is determined by a dynamic steady state that is self-organizing . As actin filaments grow, they remain fixed within the cytoskeletal network (reviewed in ). Factors that influence the concentration of free G-actin (e.g. profilin ) or ATP-binding and hydrolysis on actin (reviewed in ) will promote filament assembly and membrane protrusion. The microtubule and intermediate filament networks play a key role in regulating the global deposition pattern of the actin filaments, therefore, they will also influence membrane protrusion dynamics  (reviewed in ). Membrane tension- In order for a cell to extend its leading edge forward, the cell must overcome resisting forces. 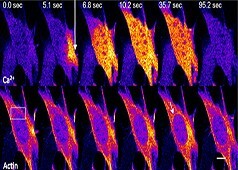 Motile cells in living systems experience external forces from the surrounding material (usually ECM), while the major force resisting extension for cells in tissue culture are tensile forces within the plasma membrane. Biophysical models  (reviewed in ) and experiments with live cells have shown that the membrane extension rate is directly dependent on the membrane tension: elevated tension lowers cell membrane extension and motility, regardless of whether the tension is applied externally (e.g. stretching) or internally (e.g. contraction of stress fibers) .